This website is hosted on small ARM based computer called Raspberry PI. Raspberry Pi is Linux based PC with 800 MHz ARM CPU and 512 MB of RAM. Its performance can be compared to the modest smartphone available in 2013. The most interesting thing about Raspberry Pi is its price – 35$ for the board, and almost no power consumption. Despite that CleanSoft in specialized in .NET development we decided to try out this idea and dive into Linux, PHP, MySQL world. Our goal was to create web server with as little maintenance required as possible and with full control over environment. Shared hosting environments are cheap but doesn’t provide control over operating system, cloud based hosting or dedicated server is too expensive to run website like this. As you can see this site is up and works pretty fast so if you want to host you website on RPi details are in the guide bellow. 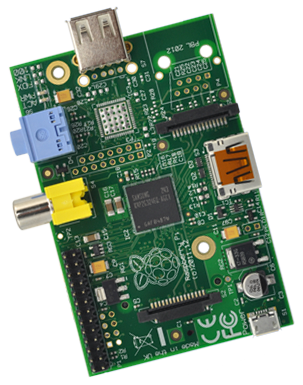 Raspberry Pi model B – you can order board online from RS components. Transparent case – everybody want to have home, this will make you Pi feel safe. 4-port Powered USB hub – you can power you Pi from phone charger or get powered USB hub. We decided to get hub to make sure we have enough USB ports for our experiment (Pi has only 2). You can check list of compatible hardware – verified peripherals, powered USB hubs. 4 GB SD card – there is no HDD in this PC, it uses SD card to boot operating system. 250 GB External USB hard drive – its not required but we use HDD to back things up. As always with experiments you don’t want to lose your work. There is no DVI or VGA connector on Pi, they are replaced by video-out and HDMI. So if you own USB keyboard and HDMI display you can work with Pi in traditional console way otherwise you can use SSH to connect to it remotely. We are building a server so it needs 24/7 Internet connection. We decided to connect it to router using Ethernet cable. USB WiFi adapter will also work, although Ethernet connection proved to be more stable in our experiments. First thing to install is Linux. We decided not get crazy here and select Linux adopted specifically for Pi and built by Raspberry Pi Foundation – Raspbian Linux. Please make sure you get default hard float version of the image – it will run faster and as everything default will be less painful to support. You can get image from Raspberry Pi Foundation, downloads page. Next step is install Linux image on SD card. Official Easy SD card setup guide covers it pretty well. After SD card is setup its time to start your Pi. We are using remote SSH access instead of keyboard + HDMI. By default SSH daemon is enabled and will be available on port 22. Your router need to have DHCP enabled to allow RPi to get IP address from it. You can find IP in the router list of connected clients or use network scanning tools. We have setup IP address reservation on our router to make sure IP will not change after DHCP lease will expire. If you are under windows you can use Putty for SSH connections – Putty Download Page. Default credentials are – [Username: pi Password: raspberry]. If you router doesn’t support DHCP address reservation you can use this guide to set setup static IP address – Raspberry Pi static IP address. 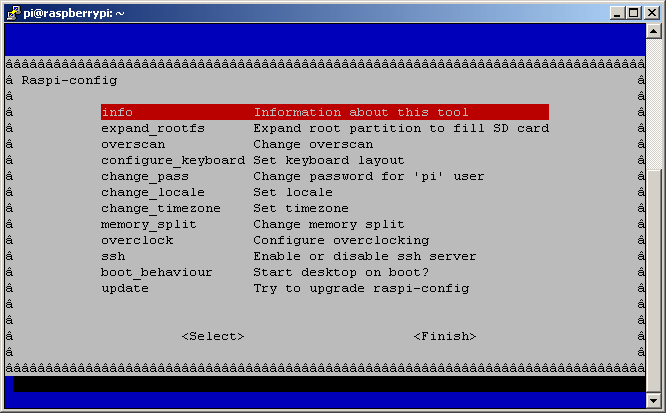 First thing to run after you log in is raspi-config utility. It allows you to configure your Pi hardware and operating system. memory_split – you are going to run server and will not utilize powerful GPU RPi has, so you want to set this value to minimum – 16.
overclock – we have selected medium setting. This allows RPi to switch to higher CPU frequency when its under pressure and doesn’t void you warranty, however it may shorten your device lifetime Please make sure you do some research on this subject before enabling this setting – RPi config, overcloking. We recommend to setup auto updates for Linux, you will not have to worry about patching your Pi. Downside of that is lack of control and risk of getting zero day security holes with latest version of software. Its up to you – more security or less maintenance effort. To set this up you need to create executable file autoupdate.sh in /etc/cron.daily which will update Linux packages daily. # A script to run Aptitude and install any upgrades automatically. # Add this to /etc/cron.daily to run the script every 24 hours. If you are going to use external HDD with you RPi for backups we recorded to use ext4 file system. In comparison to NTFS file system, ext4 usage will consume much less CPU time. Previous command should show you list of disk devices connected. You are looking for /dev/sdX, where X will be a-z. In all subsequent commands you need to replace sdX with your device name. You can use drive size to find right device. You need to setup auto mount for your HDD. At first you need to create mount point. To run WordPress you need to setup web server, PHP and database. In addition to that default set of software you will need some caching solution to make you website snappy. To make things easier you want to allow pi user to write to the www folder and also allow file uploads. You need to edit configuration of lighttpd to enable PHP and prepare it for WordPress. You need to replace www.yourdomain.com with your RPi IP or real domain name your are going to use. Some directories are missing for now but they created after you install WordPress. Make WordPress work on a root of your website – www.yourdomain.com instead of www.yourdomain.com/wordpress. Enable redirect from yourdomain.com to www.yourdomain.com – this allows to prevent duplication in search engine indexes. Make URLs pretty and hide index.php from them. Take a look on the browser address bar for an example. Enables correct sitemap.xml serving to help search engines index your site. Now we are going to create WordPress config from template. Next commands will copy config template and open it in text editor. To make sure you website is secure you need to update few security settings with values generated by this page – https://api.wordpress.org/secret-key/1.1/salt/. Just replace default settings in your config by values generated on this page. This will prevent wp-cron function to be executed on every page load. Now we need to setup manual execution of wp-cron.php every 5 minutes. This will open crontab file in default text editor. Please add following line to the end of the file to start WordPress task scheduler every 5 minutes. We will modify index.php to enable Redis caching of all static web pages. This is slightly modified version of the code taken from here – How to load WordPress in a few milliseconds using Redis. This version does not allow not-authenticated used to reset page cache using browser refresh (F5). Without this script page load time will be 2-3 seconds, with it it will be 150 ms (after page is cached). Important note here is that your cached versions of pages will not be invalidated when changes to the content are made. To remove all website cache go to http://www.yourdomain.com/?c=y while logged in. To remove single page cache you can got to the http://www.yourdomain.com/<pageaddress>?r=y. Downside of caching is that you will have to reset cache of the edited page or whole website after you make some changes. We reset whole website cache and use HTTP crawler to save all pages to the cache after some changes are made. You can get free crawler for windows here – HTTrack Website Copier. Go to www.yourdomain.com or IP address of your RPi. You should see WordPress configuration page with few settings. Fill them in, log in and go to your administration area to tweak few additional settings at /wp-admin/options-general.php. You want to make sure that WordPress Address and Site Address are the same and set to – http://www.yourdomain.com to prevent /wordpress in the beginning of your URLs. 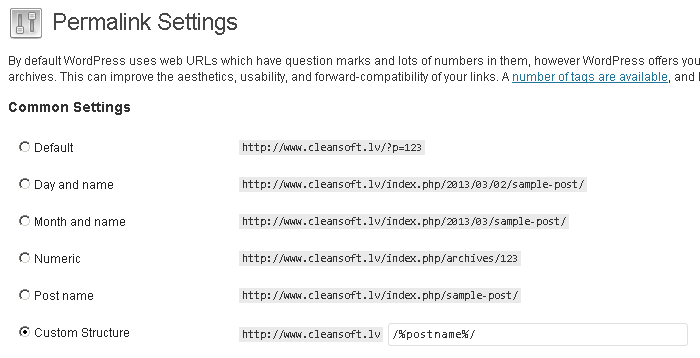 For nice URLs we recommend to enable custom permalink structure. With it enabled URLs look clean and we like clean things in software. Go to wp-admin/options-permalink.php and select Custom structure with %postname% entered after domain name. We use following plugin on our website to enable some useful features that WordPress doesn’t provide by default. BackUpWordPress – allows to schedule backups of WordPress directory and database. You can set it up to store backups in /media/usbhdd. Disable Comments – disables WordPress comments system for entire website. Disable Feeds – disables WordPress feeds system for entire website. Google Analytics for WordPress – enables Google Analytic tracking for all website pages. Google XML Sitemaps – automates generation of sitemaps to help search engines to index site. This entry was posted in Blog and tagged Raspberry Pi, Wordpress on March 2, 2013 by Alexander Shakhov.